WestLAND Group, Inc. is a strong believer in supporting charities and giving back to the community year-round. But there is something about the holiday season that makes us want to give a little more. This holiday season, we wanted to share our good fortune with our neighbors who are struggling. WestLAND Group employees participated in Inland Valley Hope Partners Adopt a Family for Christmas. We wanted to provide food, clothing and toys for these families to enable them to experience the joy of the Christmas Season. We adopted three families this year. Each family had one single parent and an average of four children. All of the children made a list of the gifts they would like including toys, clothing and shoes. 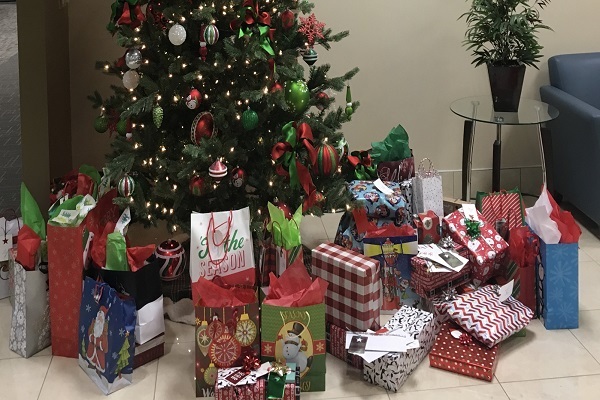 We asked our employees to kindly purchase a gift from the list, wrap it and attach a gift tag with the child’s name and return it under the Christmas tree in our lobby. As it drew closer to Christmas, the presents under the tree were overwhelming. There were a total of eleven children who received three gifts each. Inland Valley Hope Partners picked up the gifts and delivered them to each family. Bringing joy to these families this holiday season has touched our hearts and we can’t wait to give back next year.